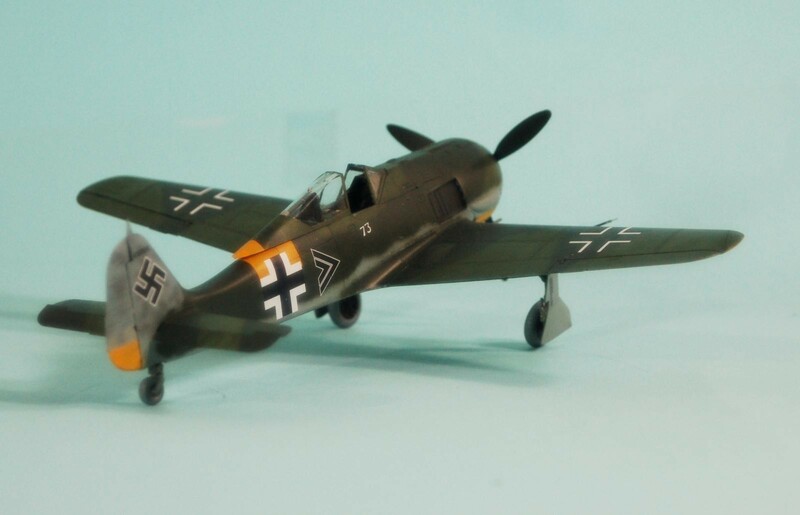 The Fw-190A series was so right in design that – once the problem of providing adequate cooling for the BMW 801 radial engine was solved – the airframe went through little modification other than minor airframe changes associated with changes in armament. 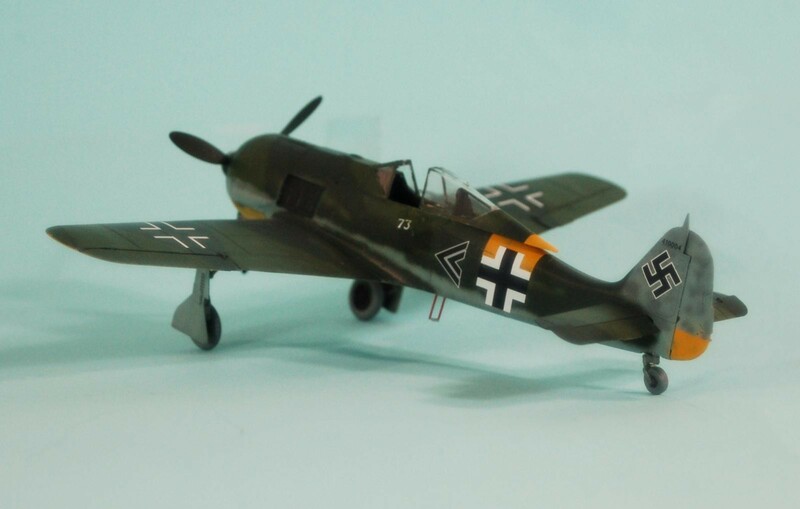 Introduced operationally on the Channel Front in the fall of 1941, the Focke-Wulf Fw-190A series, designed by Kurt Tank, immediately changed the situation, establishing clear superiority over the RAF Spitfire Vb. A captured Fw-19A-3 eventually revealed that the airplane was flying rings around Britain’s best with an engine derated 200 hp to extend engine life; the Spitfire’s only superiority was in turning circle – as Al Deere said, “Turning doesn’t win fights!” To the end of the war, the airplane’s aileron rolls gave it superiority over all opponents. 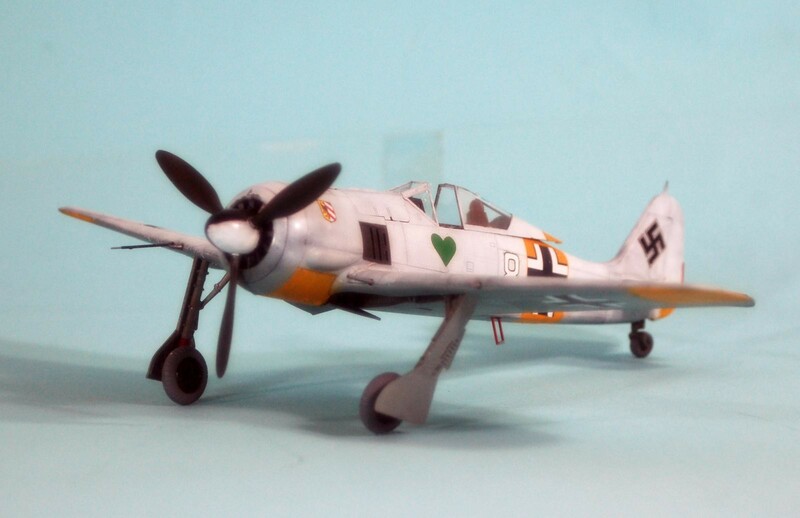 The Fw-190A-4 was introduced in the summer of 1942. 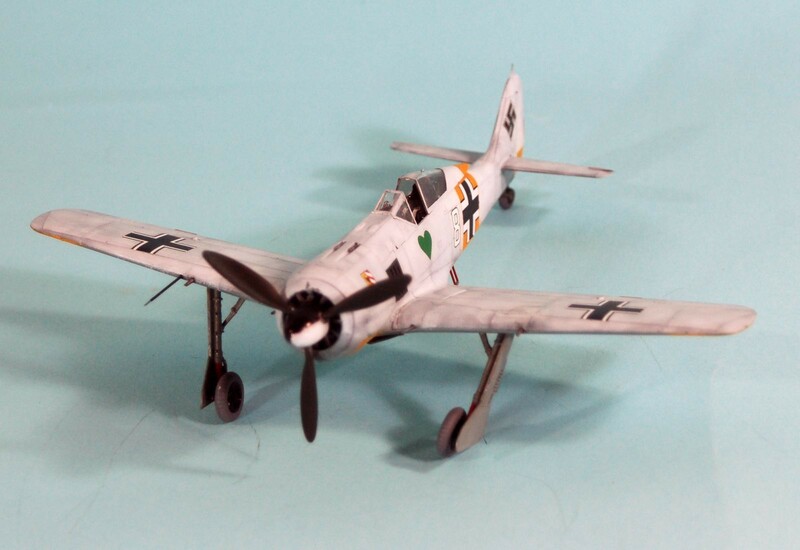 The Fw-190A-5 introduced in 1943 had its engine moved forward 6 inches which changed the center of gravity and allowed a bigger load to be carried aft. Born December 7, 1920 at Ceske Velenice/Gmünd on the Czechoslovakian/Austrian border, Walter Nowotny was known as “Nowi.” He joined the Luftwaffe on October 1, 1939, undergoing flying training at Jagfliegerschule 5 at Schwechat, near Vienna, after which he was promoted to Leutnant and posted to JG 54 on February 23, 1941, where he was assigned to 9./JG 54. Nowotny first saw combat following the invasion of the Soviet Union, when he claimed his first victories, two Russian I-153 biplane fighters shot down over Ösel Island on July 19, 1941, being immediately shot down in turn by an I-153, flown by the future Russian ace Alexandr Avdeev over Riga Bay. He spent three days and nights at sea in a rubber dinghy before finally reaching shore, to discover he was about to be listed as killed in action. By September 13, he scored his tenth victory. Nowotny found his “shooting eye” in the summer of 1942, when he shot down five Russian fighters on July 20th, following that on August 2 with a claim of seven enemy aircraft shot down for his 48th through 54th victories. 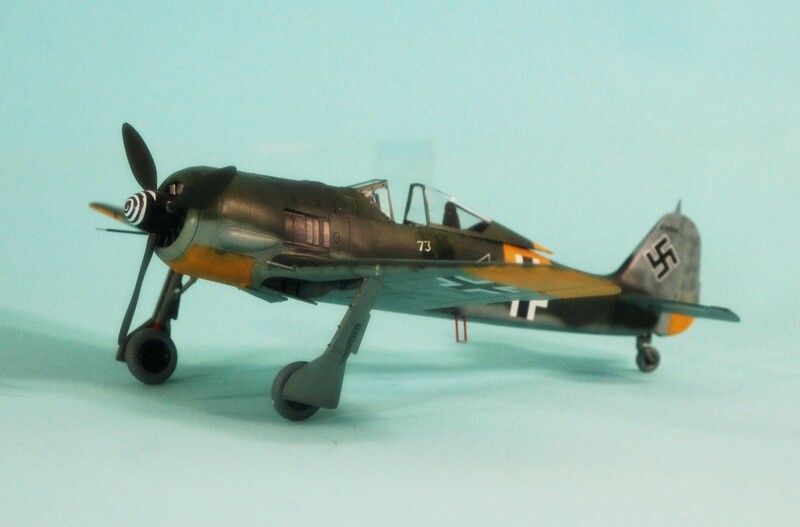 On August 11, he shot down two MiG-3s, though his Bf-109G-2 was hit and caught fire. He managed to bring the burning fighter back to his base for a crash-landing. 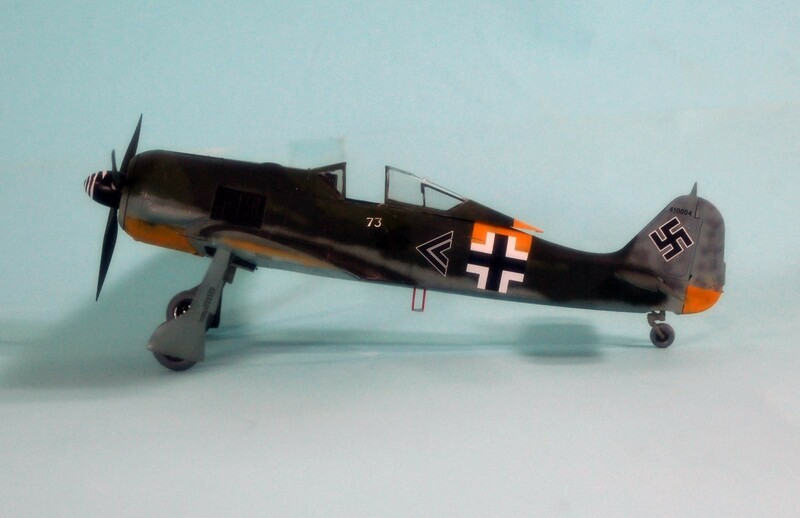 Nowotny was awarded the Ritterkreuz September 4, 1942, for 56 victories, and was appointed Staffelkapitän of 1./JG 54 on October 25th, where he began to fly the Focke-Wulf Fw-190A-4 as JG 54 was re-equipped. On March 26, 1943, Nowotny got into a fight with the first Russian-flown Spitfires, operated by the 26 GvIAP ,and shot down one for his 79th victory. Over the month of June 1943, he shot down 41 aircraft, including five on June 1, six on June 8, his 100th victory on June 15th , six on June 21, and 10 on June 24. Nowotny was appointed Gruppenkommandeur of I./JG 54 on August 10th, and shot down 49 enemy aircraft that month, including nine on August 13th , six on August 18th, and seven on August 21st. His scoring continued in September when he shot down 45 enemy aircraft, including ten on September 1st; five in a matter of 12 minutes on a morning sortie, and the other five in nine minutes at noon. He followed this with six victories the next day. He was awarded the Eichenlaub and promoted to Hauptmann on September 4th for 189 victories. He shot down number 200 among five on September 8th, then scored six each on September 14th and 15th, bringing his total to 215. 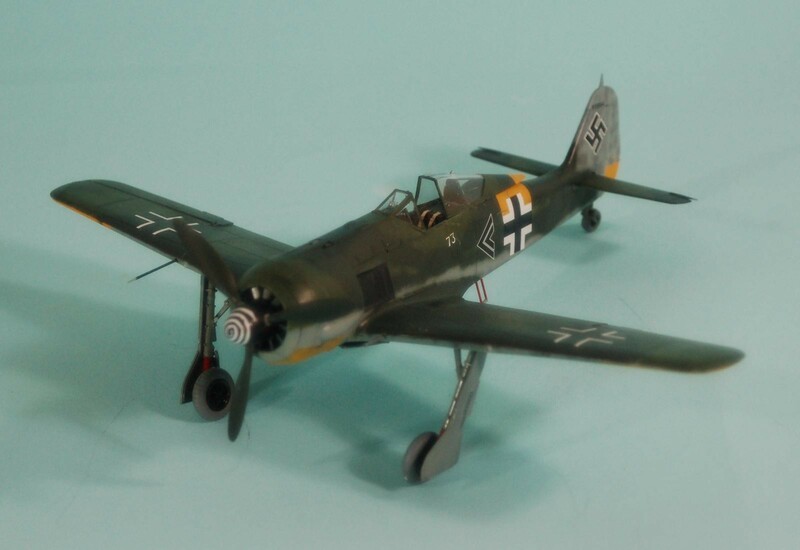 The Schwertern was awarded on September 22nd for 218 victories. During his last ten days of combat on the Eastern Front, Nowotny shot down 32 Russian aircraft, including eight on October 9th , six on October 13th and a final six October 14th, to give him 250 victories. With this, Nowotny was the first fighter pilot in history to pass 250 victories. In recognition of his status as the top-scoring fighter ace of the Luftwaffe, he was the eighth recipient of the Brillanten on October 16th. Placed in command of the first Me-262 jet fighter unit, Kommando Nowotny, in the summer of 1944, Nowotny was killed in action in November 1944 when he suffered an engine failure and was caught by P-47s of the 56th Fighter Group. 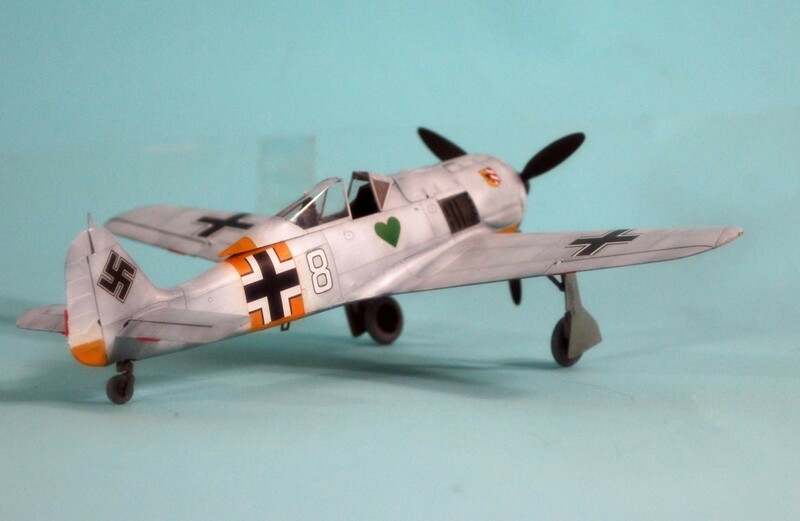 Eduard brought out a series of Fw-190s starting 10 years ago. 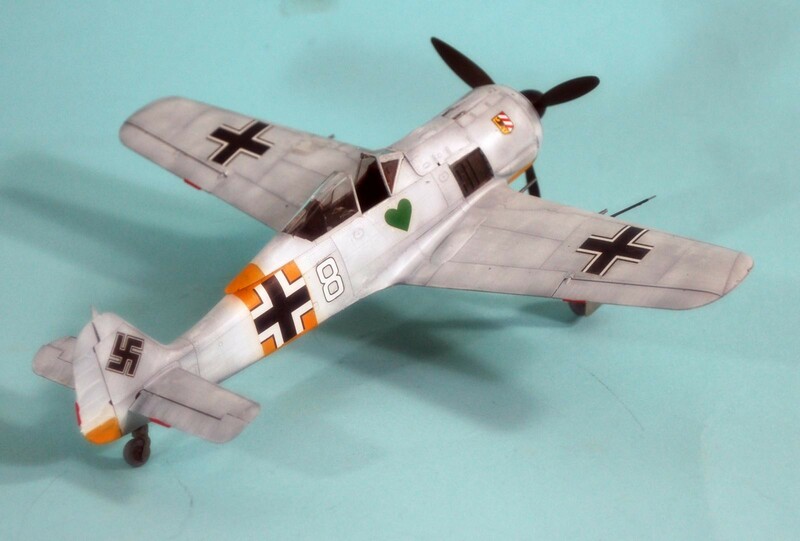 These kits were widely known for being fiddly, with lots of detail that didn’t fit all that well, and were considered “challenging.” Last year, the company announced a new series of Fw-190As, which would have a simplified design and follow the excellent level of detail and buildability established with the Spitfire and Bf-109F/G kits. The new kits deliver what was promised. Surface detail is petite and similar to that of the Spitfires and 109s. 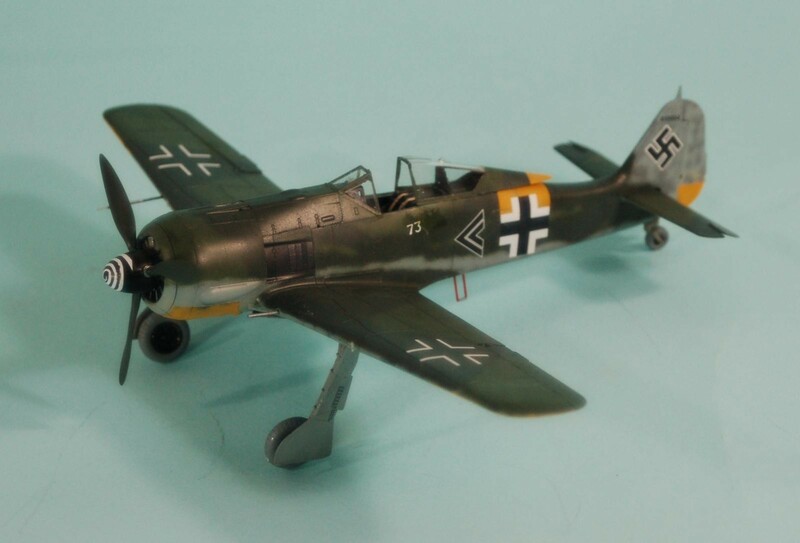 Rather than a full engine compartment and armament bays, as was the case with the earlier 190s, the kit builds up as a “curbside” model without internal detail other than the cockpit. 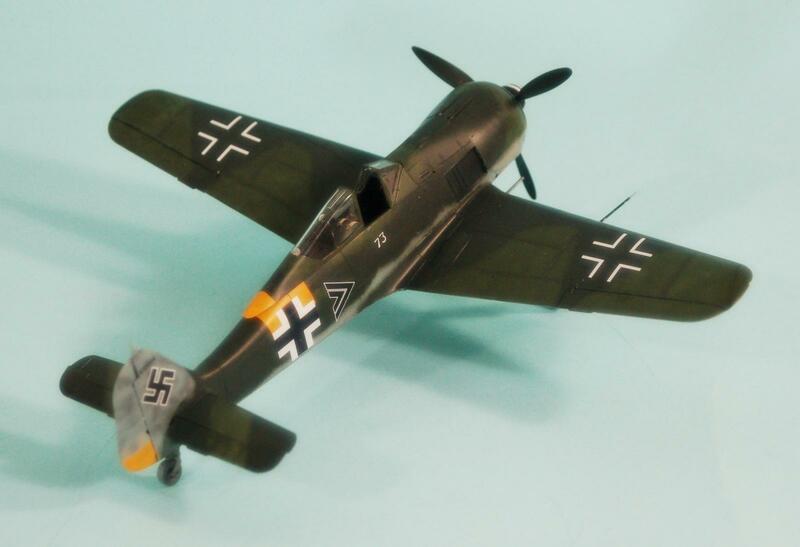 So far, the Fw-190A-4 and Fw-190A-5 have been released in Profipack kits. Each has decals for five different aircraft. 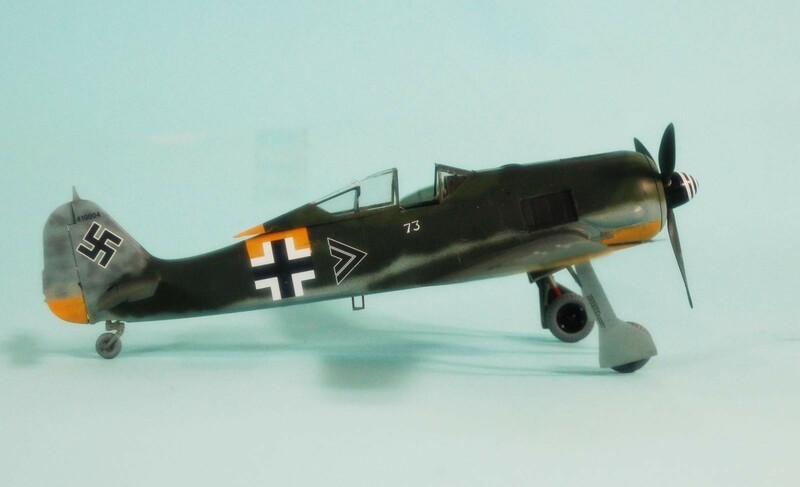 Interestingly, the Fw-190A-5 kit has all the parts in the box necessary to create any later Fw-190: A-5, A-6, A-7, A-8, F-3 and F-8. 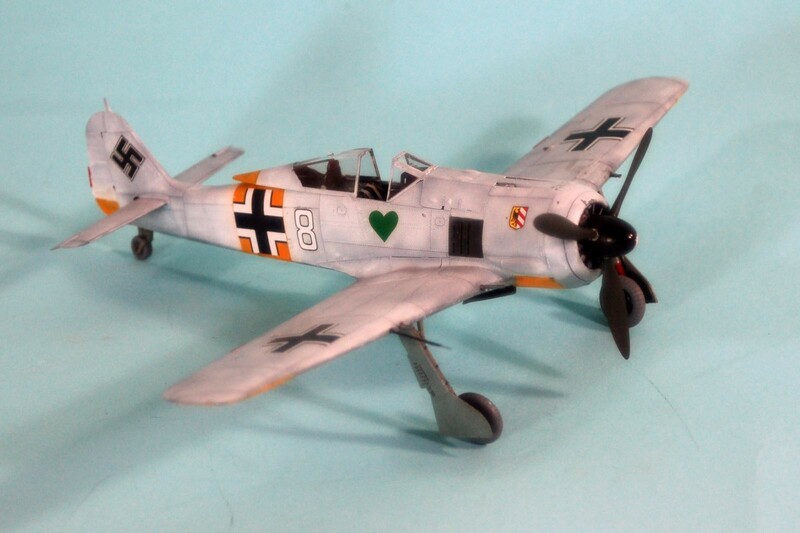 I bought the Fw-190A-5 upon release and was so impressed by it I immediately ordered an Fw-190A-4 “overtree” kit; these “overtree” kits are a real bargain at $19.95 – there are no decals but most modelers have plenty of Fw-190 decals in their collection. 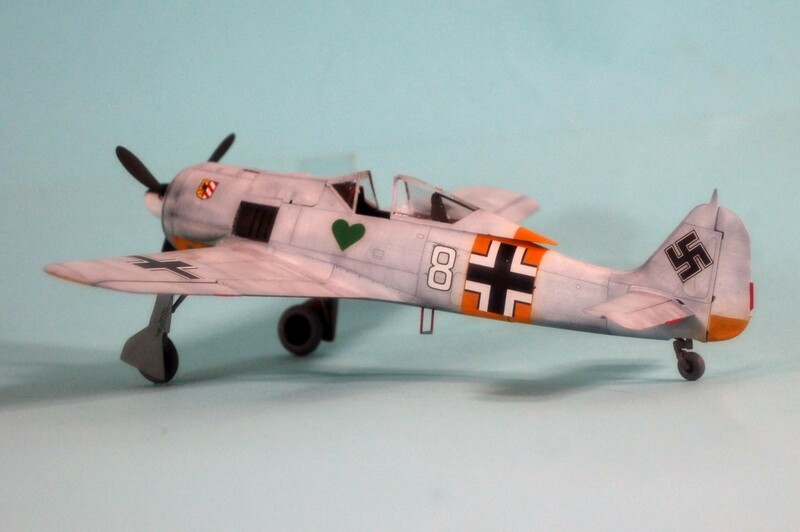 Using the instruction book for the Fw-190A-5, there is no problem doing the kit. 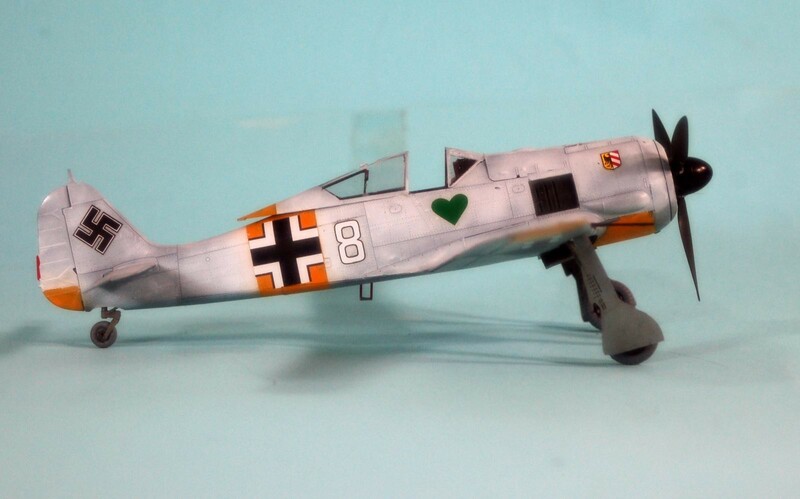 I had decided to do two of the three Fw-190s Walter Nowotny flew with JG 54: his first Fw-190A-4, for which I had decals from the Aeromaster JG 54 Greenhearts special sheet, and his final Fw-190A-5, for which I had markings on the kit sheet of the Italerei Fw-190A-5 kit. Fit is very tight with these kits, and one must be certain to clean off all sprue nubs. With care in assembly, there is no need for filler on any seams. The only difficulty I encountered was the very tight fit of the door panel of the inboard cannons to the fuselage when assembling the wing and fuselage sub-assemblies. I found that lightly scraping the mating surfaces for this area leads to a trouble-free fit, while not doing so can lead to some “industrial strength pushing and shoving.” You are advised to take the time to do that light scrape-down. I started with the cockpit, painting all the parts and then assembling them. The photo-etch instrument panels are a real improvement here, since they and the seat are about the only things really visible in that tight cockpit. 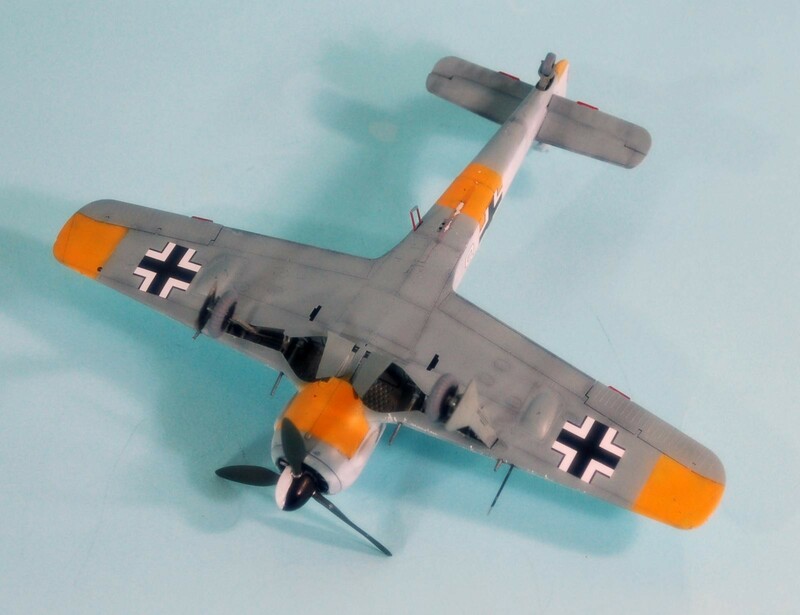 After gluing the cockpit in position and the engine plug, I finished the fuselage and set it aside. Assembly of the wing is equally stress-free, other than I suggest you cut off the forward barrels of the inner cannons, since they stick out and will get bent or broken off by handling during assembly and painting. The barrels can then be easily attached at the end of the project. I was pleased to discover that the landing gear assembly is fool proof (unless one is foolish enough to deliberately not do things right). 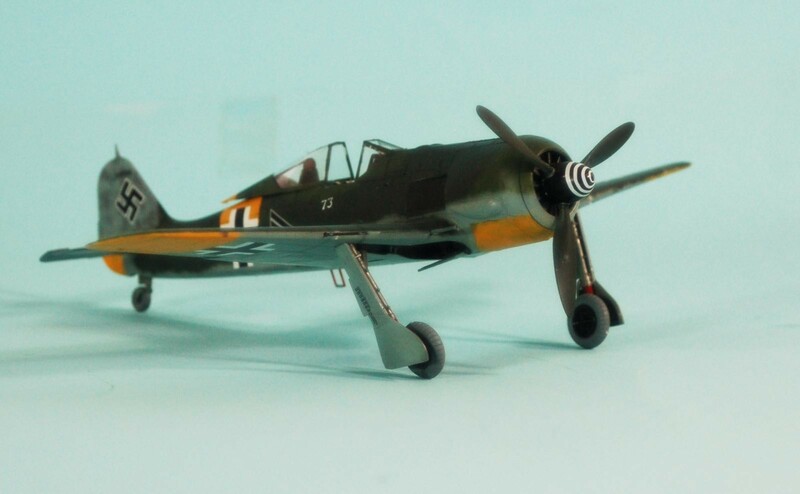 Misalignment of the main gear is the main point of failure for most Fw-190 models, but with this kit, if the gear is assembled correctly, it is impossible for it to fit otherwise than with the correct forward and inner cant. Ailerons, elevators and rudder are separate parts. I attached the ailerons and rudder in the neutral position and “drooped” the elevators. Both kits were pre-shaded, and then the yellow identification was painted on. 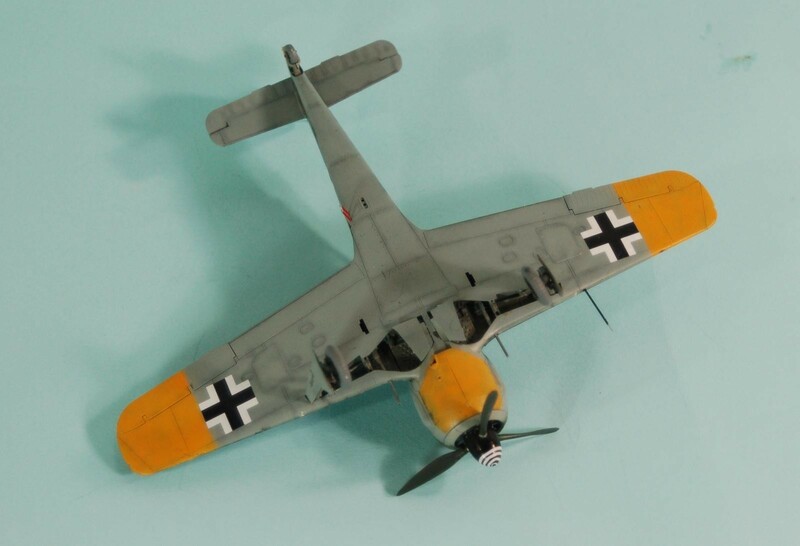 Most people have the yellow fuselage band completely around the fuselage of the Fw-190A-5, but the two photos of this airplane clearly show that the yellow band was not present below the national insignia, so I did that. 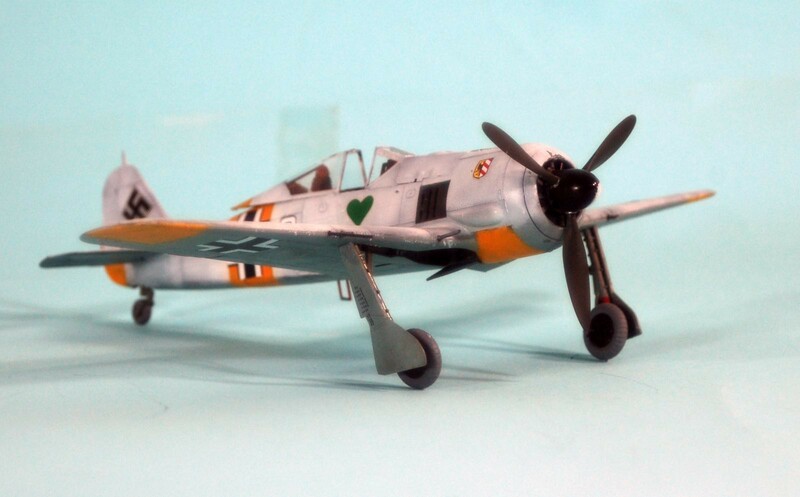 The Fw-190A-4 was painted RLM 76 Hellblau on the lower surfaces, and white on the upper. I used Xtracrylix RLM 76 and Tamiya Gloss White for this; applying a thinned coat of white allowed the darker colors of the kit and the pre-shading to show through, as if the winter camo paint was weathering off. 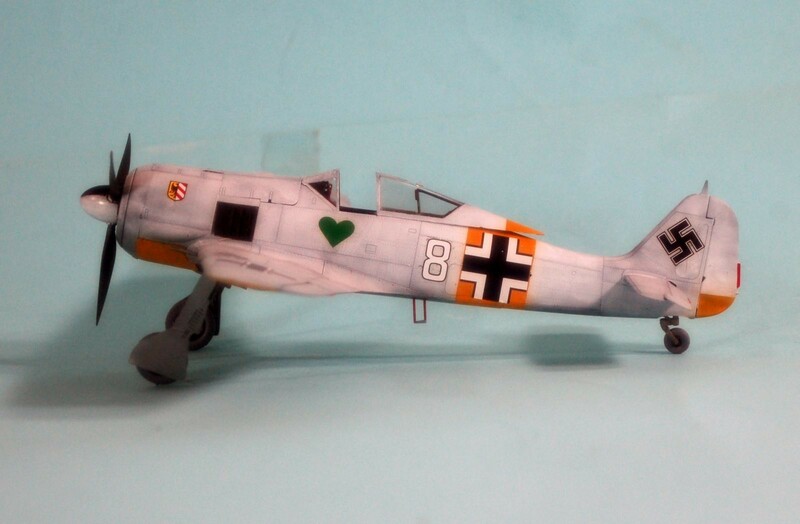 The Fw-190A-5 was also painted RLM 76 on the lower surfaces. 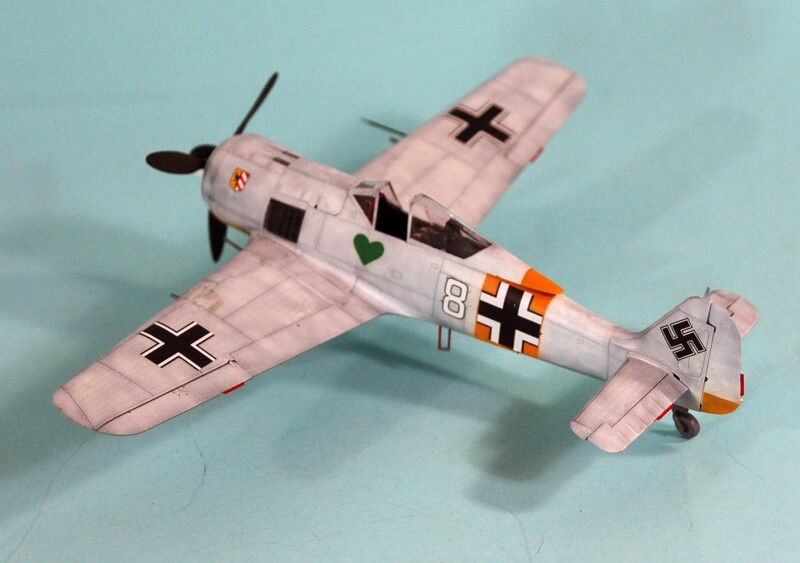 The upper camouflage was done with Tamiya “Black Green” and “Deep Green,” with the camouflage pattern freehanded. 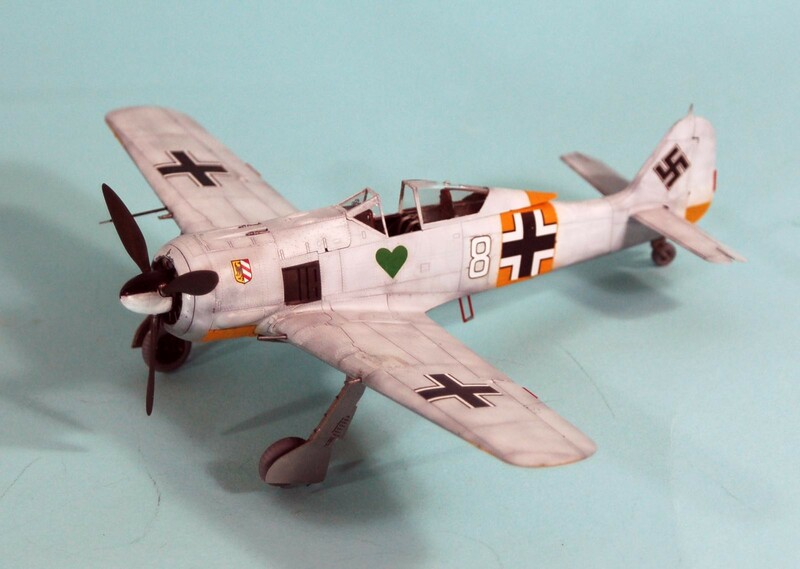 With both models, the fact the airplanes had been overpainted on their upper surfaces meant I didn’t have to worry about stencils and walkways. The deals for each snugged down into the nice surface detail after application of Solvaset. The canopies were unmasked and the sliding sections were posed open. The landing gear was assembled and attached, and the props were attached. Photos of both airplanes show they were not all that weathered and exhaust-stained, so I left that off. 23 additional images. Click to enlarge. Tom, another good presentation with a couple of gorgeous 190s. As usual Tom nice presentation and well done models. However, the tires on both models appear to me to be grey plastic. Am I seeing things ? German tires were grey because they didn’t put the coal base in to color them black. Nice job on both, Tom. You really nailed the color pattern on that A-5. 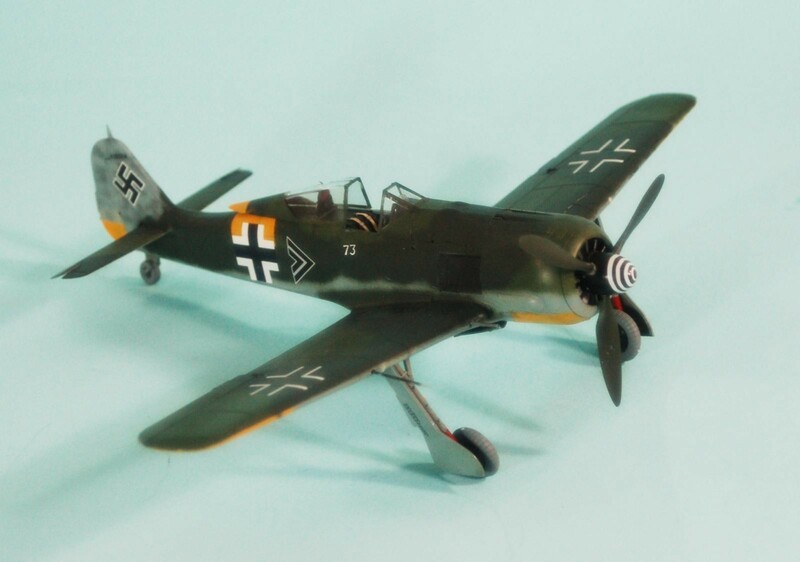 I’ve been developing an interest in German stuff over the last couple years and just ordered the A-5. Unfortunately, I don’t have a ton of decals for 190s in the dungeon and will probably pick up Proipack kits when they’re on sale. 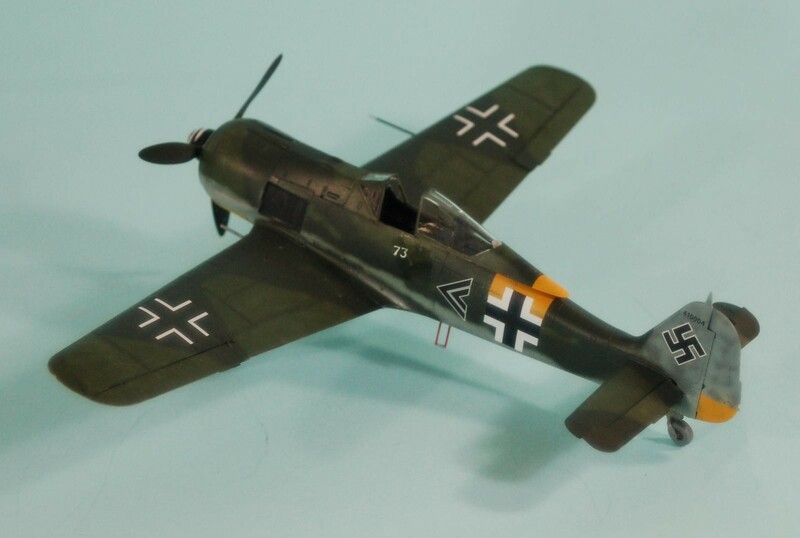 I believe that the Fw-190 has been the most popular subject in Eduard’s line of models and it neat is that they have taken the time to rethink what modelers want out of the subject matter and simplify the kit for those who don’t want to do the finer details. They do listen and the kits evolve to meet the modelers needs. Nice builds. Love the white washed version a lot! Thanx for the great write-up. I need to try one of these newer Eduard kits. Two beautiful models Tom! I also like the washed one – great for something different. Very nicely done…as usual, Tom. I’ve got two older Eduard 190A-8’s in the stash but I will have to get one of these new ones. Sounds like they solved the “engine fit” issue. PS – The winter whitewash version is my fave.